Only known depiction of Charles Click. Charles James and Alfred Henry “Fred” Click were the sons of John Click, a warehouseman born in Honiton, Devon, but who had moved north and married a Gloucester girl, Elizabeth Romans. Charles was born in 1869, and Fred in 1871; at the time, the family were living at Midland Terrace, Wotton St Mary, Gloucester. By 1881, they had moved to 11, Exhibition Street, South Hamlet, Gloucester – John was now working as a coal agent and collector, but was to die three years later, aged 43; Charles, aged 11, was working as the office boy in a political club; and Fred, aged 9, was at school. By 1891, the boys were still living with their widowed mother at 1, Montpellier Villas, Montpellier Road, South Hamlet, Gloucester; Charles, aged 21 was working as a water inspector, and Fred, aged 19, as a postman; although they both moved out to set up their own homes when they got married. In 1894, first Charles married Mary Elizabeth Steel, and then Fred married Caroline Brooks Lodge. Charles and Mary set up home at 2, Hanman Road, Gloucester, and they had 3 daughters. Fred and Caroline set up home in Tuffley Avenue, Gloucester, and they had 2 sons and a daughter, but Caroline died, aged 44, in 1910, and Fred and his children moved back in with Fred’s mother and her sister, Sarah Ann Romans, and Fred’s two sisters, at 1, Montpellier Villas. Charles Click was an adaptable player, appearing for Gloucester as both a forward and a back. He played 15 games for Gloucester 2nd XV in 1890-91 as a three-quarter, scoring 9 tries; his first appearance was against Lydney on 11th October 1890, when he scored a try on debut. He also made 2 appearances for the 1st XV that season, his debut being a hard one away at Swansea on 18th October 1890. A week later he scored again at Stratford-on-Avon, when Gloucester ran out winners by 2 goals and 4 tries to 2 goals. However, this was not sufficient to keep him in the side for the following match against Burton on 10th October, the first match played on the newly acquired Kingsholm ground. However, he did play as a forward in the other great match of that season, when the Barbarians came to Gloucester for the first time on 28th March 1892. Gloucester squeaked home 10-9, by 2 goals to 1 goal and 2 tries (a try scoring 2 points and a conversion 3). Charles consolidated his position in the first team as a forward in the 1892-93 season, when he made 28 appearances in the 30 matches played, and scored Gloucester’s only points in their 2-2 draw with Hartlepool Rovers on 4th April 1893. He still fitted in another 3 games for the 2nds. He played a further 13 games for the 1st XV and one for the 2nd XV in 1893-94, but that proved to be his last season for the Club except for one appearance much later for the 2nds in 1896-97. His last game for the 1st XV was against Bristol on 3rd March 1894. He bowed out with a record for the 1st XV of 62 appearances and 4 tries. Charles died in Gloucester in 1932, aged 62. 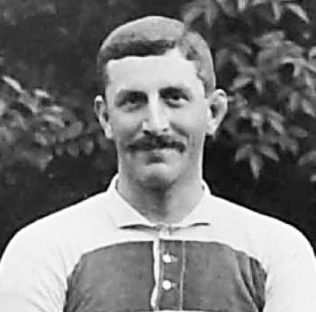 Fred Click was a forward, whose career in the Gloucester 1st XV kicked off two years after his brother in the 1892-93 season. His brother played in all but 2 of the Club’s 1st XV fixtures that season, whilst Fred was selected for 6. 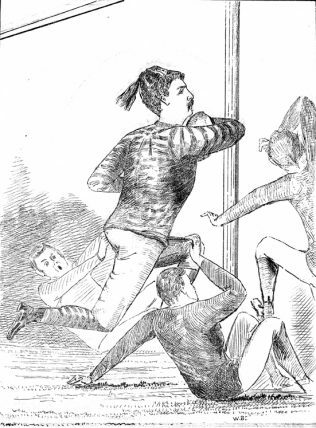 His first appearance was against Cardiff Harlequins on 21st January 1893. He also played 9 games for the 2nd XV. The following season, 1893-94, Fred played 19 games for the 1st XV and 7 for the 2nd XV, and his name replaced his brother’s on the Club Honours Board. He scored his first try for the Club in a 2nd XV match against the Gordon League on 7th October 1893, and his first for the 1st XV at Bridgwater on 10th February 1894, in a match which Gloucester won 13-5. Fred did not appear for two seasons, 1894-95-96, thus missing the “black” season of 1895-96, when more matches were lost than won. However, in 1896-97 he was back as a regular in the Gloucester pack, and played in all but one of the Club’s 31 fixtures (no-one played more), scoring his first try at Kingsholm in a 25-0 win against Clifton on 16th January 1897, and going on to score further tries against Cheltenham, Manchester and Bath, the last two on successive days over the Easter period. He also played in one of Gloucester’s most famous victories on 3rd April 1897, when Llanelly came to Kingsholm and were beaten 5-3, their first defeat of the season, thanks mainly to a sterling performance by the Gloucester pack. This was to be the first of 7 seasons in which Fred was pretty well ever-present in the team. In 1897-98, Fred played in 31 of the Club’s 35 fixtures (two of these absences whilst representing Gloucestershire), of which only 6 were lost. Fred scored tries in successive matches against Penarth and Clifton. In the Citizen, WB declared the season to be “a memorable one, and one that may very well be regarded as among the most brilliant in the history of the Club” whilst also claiming that “Gloucester is the only team in England unbeaten by an English club; whilst another fact of which Gloucestrians might well be proud is the retention for another year of the club championship of the County”. Of Fred himself, WB commented that “Click and Rose (both honest workers and useful in the open) have tendered splendid service”. Fred made his debut for the County in a friendly match (insofaras any match against the Welsh was friendly), against Glamorgan at Cardiff on 7th February 1898; and was selected again for Gloucestershire in another friendly against Surrey before the end of the season. In 1898-99, Fred played in 32 of the Club’s 34 fixtures (only George Romans played in more), and scored 2 tries. The record was won 27, lost 6, drawn 1, with points for 300 and against 116. WB summarised it as “a brilliantly successful season, and one which will form one of the brightest chapters in the history of the Club”. Fred was part of a marvellous Gloucester team which won against Llanelly at StradeyPark for the first time, and followed up with victories at Kingsholm against Swansea, Cardiff and Newport. WB wrote in the Citizen: “the displays against Llanelly, Swansea, Cardiff and Newport will ever be remembered amongst the finest things accomplished by a Gloucester pack.” – Fred Click “rendered sterling service”. When news of the 6-3 success at Stradey reached a large crowd which had assembled at the Cross in Gloucester, there was elation, and many remained to greet the team home at Gloucester station at midnight with a brass band adding to the celebrations. In 1899-1900, Fred played in 30 of Gloucester’s 34 matches, during which they were unbeaten in 19 fixtures against other English clubs. He scored 3 tries the first 2 against Old Edwardians and Stroud. And towards the end of the season, on 12th April 1900, Fred, like his brother before him in 1892, played against the Barbarians. But Fred went one better and scored in the 13-0 victory at Kingsholm, his try being described in the match report as “A splendid touch-kick by Romans enabled Gloucester to reach the centre, where, from some loose play, the ball got to Whacker Smith, who put in a sharp punt. The ball in its transit touched a visitor, and the City forwards being put on side, Lewis picked up and ran and passed to Click, who romped over with a good try.” This match had been arranged to try to recover some of the losses incurred as a result of staging the England v Wales international at Kingsholm. Fred also won 2 further caps with Gloucestershire against Surrey and Glamorgan. With 30 appearances in 34 matches, Fred was again one of the most consistent performers in 1901-02, and scored tries against Bath, Clifton and Coventry. The last of these was a 22-0 win for Gloucester which still provoked WB to report that it was “a poor game spoilt by the referee who was as usual awful (W L Williams, Moseley)”. Fred won a further cap for Gloucestershire when the County selectors picked 12 Gloucester men to play against Somerset, but he missed out on the County Championship Final which Gloucestershire lost 3-9 to Durham at Kingsholm. Fred finished his career for Gloucester with 225 appearances and 16 tries obtained over a period of 11 years. At the Club AGM in 1904, on the motion of Mr G Romans seconded by Mr W H Taylor, Mr A H Click was recommended to the Committee for life membership of the Club. Fred died in Gloucester in 1939, Aged 67.